These are our suggestions, although we would be pleased to assist you in customizing a package to meet your specific needs. A must before any baby arrives! Your visit begins with a 45 minute prenatal massage. Our pregnancy cushion is used to provide comfort and support. This treatment will focus on reducing swelling, tension, and relieving unwanted discomfort. Finishes with a Signature Spa Pedicure and a bowl of delicious vanilla ice cream. This getaway is not only for your mind and body, but for your taste buds too!! Sit back and enjoy pure relaxation while sipping on a virgin spritzer or beverage of choice. This treatment includes a hydrating paraffin foot treatment, express tropical pedicure, finishing with a express tropical manicure. This treatment is guaranteed to create total relaxation, beauty, and a beautiful bond between any mother and daughter. It’s never too early to experience the tranquility of relaxation and beauty. This package is designed for girls 12 and under. Unwind with a 15 minute massage, followed by a mini pedicure and mini manicure. Dazzle your nails with our unique choices of glitter and gems for both your fingers and toes. Enjoy all this pampering while sitting back and sipping on a cool glass of lemonade or warm cup of hot chocolate. Celebrating a birthday, anniversary, wedding, special achievement, or simply looking for an excuse to treat yourself? This package is the perfect choice! Begin your day with a full one hour Hot Stone massage, followed by our popular Classic Organic Spa Facial and Signature Spa Pedicure. No celebration would be complete without a cupcake and candle. Replenish the body and rebalance the soul. This getaway begins with a relaxing 45 minute Hot Stone massage treatment. Following your massage, let your tired feet be hydrated with a paraffin wax foot treatment. While your body relaxes and your feet are soothed, satisfy your taste buds with a signature chocolate treat. This treatment covers you from head to toe. Unwind with a Reflexology Foot Treatment while your hands are hydrated with a deep hydrating paraffin wax hand treatment. Finishes with a deeply relaxing Ayurvedic Head Massage. 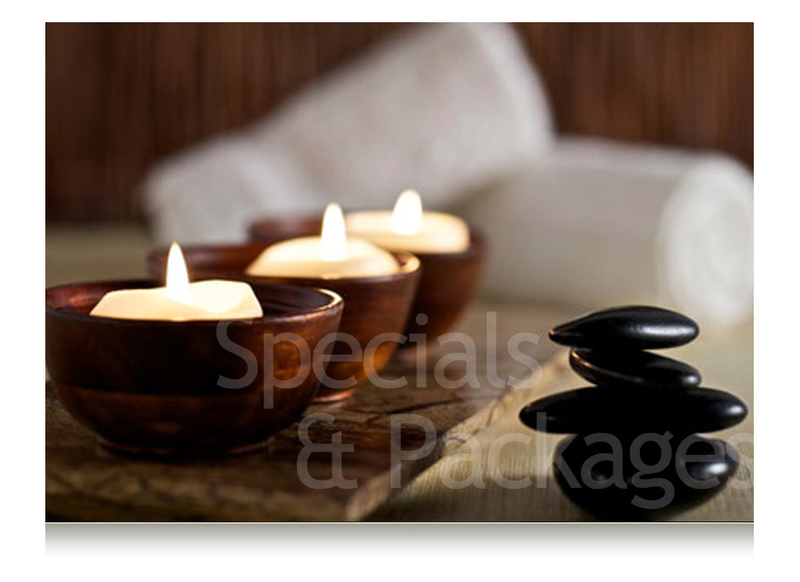 This treatment also includes a cup of our premium loose leaf tea and decadent chocolates! Come to the islands to awaken your senses. This tropical escape includes a yummy Mango Enzyme Treatment & Blueberry Slimming Body Wrap to soften you from head to toe. A Tropical Spa Facial that will leave you looking positively rejuvenated. Complete with our signature fruit tray or decadent treat. This getaway is all about Chocolate! Our Chocolate Truffle Body Wrap will detoxify and hydrate your body leaving you feeling silky smooth, just like chocolate! Concludes with a yummy Chocolate Mousse Pedicure Treatment. Totally non-fattening and extremely YUM! This package also includes specialty chocolates! This package has what it takes to be refreshed and renewed! Unwind and unwrinkle those unwanted fine lines with our Anti-Aging Signature Facial. Renew your hands with our Anti-Aging Spa Manicure and refresh your tired toes with our Signature Spa Pedicure. You will leave looking as young as you feel! This package includes a cup of our premium loose leaf tea and signature fruit tray or decadent treat.